Yes It Is A Scam – Don’t Call That Number! Also take notice of the “24/7 Unmatched Service and Support”. With a quick glance you might mistake for the image for a Windows logo, but upon further inspection they don’t match. Next take a look at the smaller pop-up on top of the large one; this one serves two purposes, first is to reiterate you must call them NOW and second is to amp up the fear, “Possibly Privacy Breach and Computer Error Detected Due to Suspicious Activity Found On Your Computer.”. “Ads by Click2Save” Wait!?! What?!? This pop-up is nothing more than a paid for advertisement??? Exactly, it’s nothing more than a scam to get you call that number and have one of two scenarios play out. Either they are going to try and gain access to your personal information in order to steal it or they are going to try and sell you fake software or services that you don’t actually need, at a cost to you of hundreds of dollars. 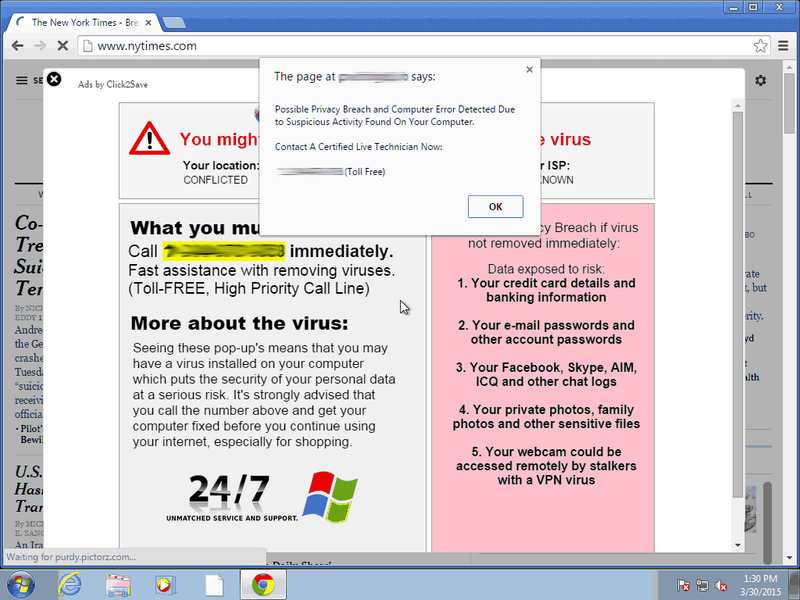 So you find yourself with this pop-up on your screen, you’ve realized it’s fake, you’re not going to be calling these thieves, but how do you get the pop-up to go away? As if the ad itself isn’t bad enough, this is one of those Ads that is bound and determined to stay with you. Clicking on the “X” seems to take most people into an irritating loop where the two windows continually to appear, one on top of the other. With testing we have been able to successfully close the Ad by simultaneously clicking the “X” and pressing “Esc”. If that doesn’t work try going to your task manager and forcing the browser to shut down, End Task, that way. If that still doesn’t work you may be left with the only option of shutting down your computer. Once you’ve successfully closed the Ad you’ve likely avoided any danger, but you can always take it to a local computer company, like Top Speed Computer Service, to make sure no damage has been done. Pass along to your friends and family to make sure they are not victimized by this scam either!